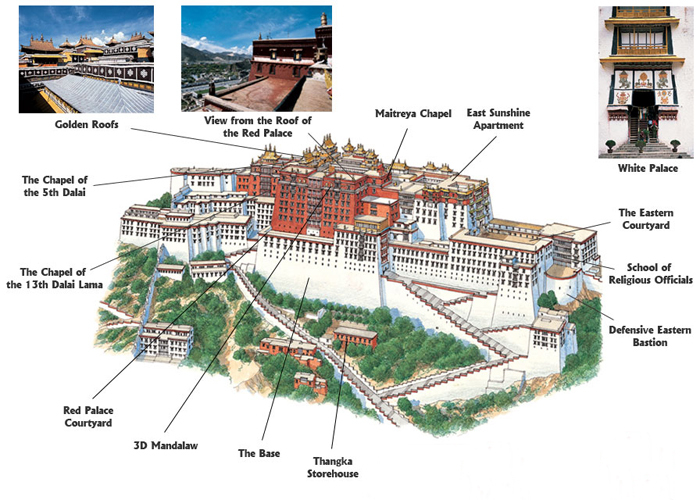 The Potala Palace (Tibetan: ཕོ་བྲང་པོ་ཏ་ལ་, Wylie: pho brang Potala) in Lhasa, Tibet Autonomous Region was the residence of the Dalai Lama until the 14th Dalai Lama fled to India during the 1959 Tibetan uprising. It is now a museum and World Heritage Site. The palace is named after Mount Potalaka, the mythical abode of the bodhisattva Avalokiteśvara. The 5th Dalai Lama started its construction in 1645 after one of his spiritual advisers, Konchog Chophel (died 1646), pointed out that the site was ideal as a seat of government, situated as it is between Drepung and Sera monasteries and the old city of Lhasa. It may overlay the remains of an earlier fortress called the White or Red Palace on the site, built by Songtsän Gampo in 637. Tradition has it that the three main hills of Lhasa represent the "Three Protectors of Tibet". Chokpori, just to the south of the Potala, is the soul-mountain (Wylie: bla ri) of Vajrapani, Pongwari that of Manjusri, and Marpori, the hill on which the Potala stands, represents Avalokiteśvara.